The water in Lake Champlain is warming up and sailors are preparing to hoist the sails! Summer is drifting in, and Lake Champlain is beckoning for people who like to sail, paddleboard and kayak. 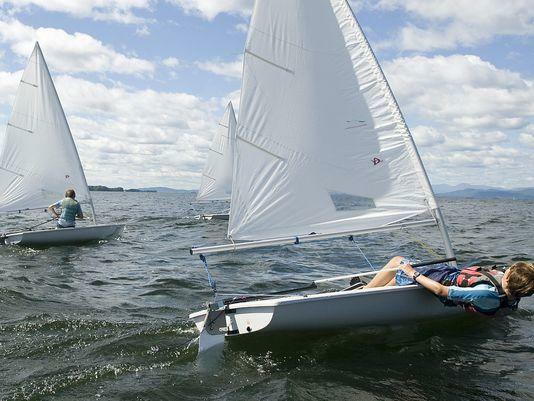 The Lake Champlain Community Sailing Center in Burlington rents all of the above and offers a range of classes and races to get everyone out on the beautiful lake at the foot of Burlington. Free Press writer Molly Walsh caught up with CSC Executive Director Mark Naud and Marketing & Development Director Sarah Smith to talk about what the Center offers. BURLINGTON FREE PRESS: So, how cold is Lake Champlain right now for folks who slip off their paddleboards? MARK NAUD: Pretty cold, but warming up all the time. BFP: Tell us a little bit about the range of boats at the Sailing Center. What’s most popular these days? MN: We have about 90 watercraft to choose from — ranging from our Sonar and Rhodes keelboats, to 420 dinghies, to kayaks and paddleboards. Our keel boats are very popular since they are bigger and more stable for a leisurely cruise around the harbor. The 420 dinghies are nimble, quick and a bit closer to the lake, so more opportunity to get wet. And of course our paddleboard fleet is always out on the water. BFP: Who founded the Sailing Center, and how did it come into being? MN: Over 20 years ago, local architect and sailor Marcel Beaudin developed a vision for the Moran Generating Station. He gathered a group of like-minded community leaders and sailors and founded the Lake Champlain Community Sailing Center. Mayor Peter Clavelle, Parks Director Wayne Gross, and the City Council enthusiastically approved a resolution to lease a portion of the Moran yard and building to the center for its initial programs. There were a few other community boating or sailing programs developing around the country, so they modeled it on those in Boston, Milwaukee and Miami. Now we are a national model for the next movement of community access facilities around the country. BFP: The views are spectacular — better than a lot of private yacht clubs. What’s your favorite time of day to look out from the dock? SARAH SMITH: The best time of day to look out from the dock is either at 7 a.m. or 9 p.m. First thing in the morning everything is so calm — the dock is totally empty, yet there is this undeniable promise of great things to come — dreams and discoveries seem so close. It’s like that Folgers Coffee ad we all grew up with: The best part of waking up is … looking out onto the lake! There is something to be said for grabbing a buddy, sitting side by side after a long day, maybe dangling your toes in the water, leaning back and taking in the last moments of sun as it dips low behind the Adirondacks. A certain sense of accomplishment and happiness penetrates the soul in these moments — and sense of belonging and meaning that you can’t find anywhere else. BFP: While the views are amazing, the old Water Department garage where your office is located is pretty decrepit. What are the building’s quirks, and how do you feel about the plans for the new space as a result of the tax increment financing (TIF) approval this spring? MN: The garage is great, as long as the door is open, and the sun is shining! It isn’t so great when it’s cold, blustery and gray. It can get a little lonely in the winter. When the jet engine generators are fired up periodically next door, it gets a bit noisy, and the building rumbles. But we did get running water, some heat and the use of a flush toilet in the winter, which is way better than the port-a-potties. That’s why we’re so excited about the Ballot No. 2 initiative that the voters enthusiastically supported for the revitalization of the northern section of the Waterfront. The allocation of $500,000 of TIF funding for public infrastructure investment to literally lay the groundwork for a new waterfront facility is a transformational opportunity for us and the community. The new building and storage yard are designed and permitted to accommodate our remarkable growth over the last decade. It will have classrooms, offices with windows, locker rooms with showers and flush toilets, and so many amenities built for our programming. Finally, we will have a world-class public access facility on Burlington’s world-class waterfront. BFP: You must know Lake Champlain’s moods fairly well. Describe the range of weather that sailors and other boaters can expect when they head out on the big lake. MN: I grew up in Michigan on the Great Lakes, and I’m happy to tell everyone that this is the greatest one of them all. Lake Champlain is a challenging, dynamic body of water. She’s not as large as the Big Five, but she’s just as moody. It can be idyllic and placid and then be churned into a fury in a matter of hours. That’s why we monitor the weather closely and have U.S. Sailing-certified instructors on duty. Most boaters can expect what they see out on the lake at any given moment, at least for the next few hours. And we’re here to keep an eye on things to be sure her moods don’t get the best of anyone out on the lake. BFP: You don’t have to spend much time on Lake Champlain to know it can dish up some big chop. What kind of motor boats do you use to navigate the swells and check on people when the wind and waves really kick up? MN: We have a number of safety boats that we use to give instruction and to support our sailors and paddlers when the lake starts to get more active. The primary boats are Carolina Skiffs with 40 HP 4-stroke clean engines. All of the staff practice safety maneuvers and get fairly skilled in managing the chop and wind while navigating the lake when she gets lumpy. BFP: How often do sailors come in “hot” to the dock — that is, bash into it when they navigate their way in? Any bad dents? MN: Well, lots of bad dents — it’s part of their charm! Our boats get a lot of use — from really skilled sailors to novices —and bumps and bruises to the hulls and docks are part of the experience. Some come in hotter than others, and part of our instruction is learning how to maneuver and use the sails and wind to turn down the heat so our staff and volunteers can play on the lake, rather than play with fiberglass for repairs to someone else’s dents. BFP: You run leadership courses, among other programming. Is there something about mastering the water and the sails that builds confidence? MN: That’s really the essence of what we do … using sailing as a medium to develop character and life skills that can be transferred to everything you do. Sailing is about constantly adjusting to the dynamics of wind, water and waves, communicating with your crew or skipper, raising your perception and awareness of your surroundings, respecting the power and awe of this remarkable lake, benchmarking yourself and increasing your self-esteem and confidence while mastering the relatively simple physics of sailing. It’s both for the individual and the small group that is embarking on another new voyage. That’s why our motto is: Lake Access. Life Lessons. For All. BFP: What was your worst/most entertaining mishap under sail? And what did you learn from it? MN: Capsizing is part of the learning experience for everyone, whether novice or pro. It’s also part of the fun. Sometimes it is harder to get things turned right side as easily or quickly as you’d like. So when you’ve turned the boat over 180 degrees and drift into the mud with the mast stuck in the bottom … things aren’t going so well. Slipping and falling overboard can be entertaining, and embarrassing, as long as the conditions aren’t too rough. You learn to have one hand for yourself and one for the boat. Hold on and stay on! BFP: Sailing newbies might be a little bit daunted at the number of steps involved in rigging even a smallish sailboat. Is there a shortcut to learning how? MN: The best shortcut is to come down to the Community Sailing Center and take one of our courses. Like anything in life, you have to practice. BFP: You give people quizzes before they can rent a sailboat. What’s the toughest question? And how many people really know a run from a reach? SS: (The test) is set up to show that maybe you have been on a boat before and won’t end up crashing head-on into the lighthouse. There are many incredible sailors who don’t know a run from a reach — and the “test” is specifically formulated to make sure even those without the vocab can get out on the lake. Most of the questions involve pictures! BFP: The hunks-of-rock sculptures on the waterfront next to your boat storage area are unusual. Do people ask about them? Does the staff have a nickname for them? SS: Stonehenge! No, nobody really asks about it. Maybe they’re scared to ask. I certainly was! The city recently relocated the rocks as part of the Waterfront Action North project. BFP: Sailboarding used to be pretty popular, but it seems like a lot more people are interested in paddleboarding now. Do you rent windsurfers any more, or did you ever? And what do you think the next trend might be? MN: We never really rented sailboards, though lots of folks come down and use the center to get out on the lake with their own boards. Kiteboarding is very popular now, whether the lake is wet or hard and snowy in the winter. Sailboarding seems to be making a bit of a comeback, and we’re looking into that again. Paddleboarding is clearly the hottest trend right now. After the America’s Cup coverage last year, catamaran and multi-hull sailing is becoming the next big thing, even though it’s been around for hundreds of years. BFP: You run Friday-night sailboat races and some regattas, right? If everyone had the same equipment, what would set the winners apart from the rest? Killer competitive drive? Keen sense of tactics? Understanding the wind and waves? SS: Free Friday Night 420 Racing has become a kind-of locals-only throw-down extravaganza. Fathers and sons, college roommates, sisters on the high-school team and grandma and grandpa all come down to show off their skills. What sets people apart? Well, it all depends on the night. Maybe you catch a good header, or maybe a passing motorboat sends some waves that push you ahead. Who knows! It’s anyone’s game. That’s what makes sailing so great — any BODY can do it and win. That being said, there is a local legend around the CSC. You may have heard of him. Around here he is known as “Eagle Eye.” He knows Lake Champlain better than anyone, killer competitive drive, and keen sense of tactics. Watch out for him! BFP: Obviously not everyone “gets” sailing. It takes time to set everything up, and money — sometimes a lot of money — to buy and maintain a boat. Why do people like sailing as opposed to, say, racing a cigarette boat across Burlington Bay? MN: I think that sailing is far less expensive than many people think and is no longer the elitist sport it was once. That’s a big part of our mission — to break down the barriers of access to the lake, whether physical or financial. Motorboats are far more expensive and constantly require fuel to keep them moving. Sailboats harness the sun and wind and the humans on board to keep them moving, and are just as thrilling, but more peaceful and engaging. BFP: Have you ever seen Champ? And assuming the answer is no, what is your best hunch on Champ’s real identity. Giant lake trout? SS: No, I’ve never seen Champ — but I do believe! I think the saying goes that we know more about outer space than we do about what’s at the bottom of our great waters. I think the reason I became a good sailor was because I was terrified a whale, like in Pinocchio, was going to come eat me, and I would have to live out my years in a whale’s belly. Champ is just like that whale; he just encourages kids to sail faster and better! We couldn’t ask for more. BFP: How much does it cost to join the LCSC for the summer — family and individual. SS: We pride ourselves on being a “non-membership” organization. We welcome all shapes, sizes, colors, poor or rich. Like the local ski resorts, we have season passes, which vary in price from $200 for a student to $725 for a family of five. To learn more about the Sailing Center visit www.communitysailingcenter.org. BURLINGTON, VT- The water may be just a bit cold, but if you’ve been itching to jump in a kayak and paddle on the water, you’re in luck! Burlington’s Community Sailing Center opened Saturday, with a discount on their season pass. If kayaking isn’t your thing, they have paddleboards, sailboats, and canoes you can access. The center also has programs throughout the summer which allow people to enjoy the lake in a group atmosphere as well, just one of the many great ways to get out on the lake. “Keel boats, dinghys, stand up paddle boards, kayaks, canoes. The season passes allows you to use all of those things for the whole summer. So its llike a ski pass or a gym membership to get you out on the lake, active, having fun,” said Tom Stark, the Waterfront Director at the Community Sailing Center. The center also does hourly rentals. Ronald McDonald House Charities of Burlington awarded grants totaling $28,750 to Boys & Girls Club of Rutland County, Burlington High School, Howard Center, Lake Champlain Community Sailing Center, North Burlington Little League, Run Vermont, Service Rendered, Inc., Visiting Nurse Association of Chittenden & Grand Isle Counties, and VSA Vermont, Inc.
BURLINGTON, Vt. —On Town Meeting Day, Burlington voters overwhelmingly approved plans to revitalize the city’s waterfront, so how are the projects coming along? The Community and Economic Development Office, which is overseeing the slate of six waterfront investments, predicts you could start seeing changes along Lake Champlain by the end of summer. Before bids are put out on the projects, CEDO is looking toward the lake, figuring out how the harbor has changed in the past decade. Wildfire said wind and wave patterns have changed since the last harbor study. What Wildfire called the “spine” of the waterfront projects, Waterfront Access North, will begin construction later this summer, he said. The city put in a $7.8 million bond application last week for upgrades near the Moran Plant to the bike path, Waterfront Park and the sailing center and better access to Lake Champlain from that area. As for the Moran Plant itself, project leaders have filed as a non-profit to raise money. Developers must raise tens of millions of dollars to privately fund the project. They plan to revitalize the building that has been vacant since the 1980s with public spaces, restaurant and a brewery. Wildfire said Moran Plant developers have raised more than $200,000 to commission a study to see if they can pull of their design. The city is waiting to hear from the Agency of Natural Resources regarding improvements to Waterfront Park. The city has planned $800,000 in upgrades to improve electric and water infrastructure. Designers have begun work on a new marina design. They are waiting for the result of the Harbor Management Plan. Leaders at the ECHO Lake Aquarium and Science Center have laid out what they want in a Sustainability Park to be built outside the center. City Council will become more involved as the spaces require lease agreements to move forward, Wildfire said.